I expected a quite funny, middle of the road film and I think this is just what I got. 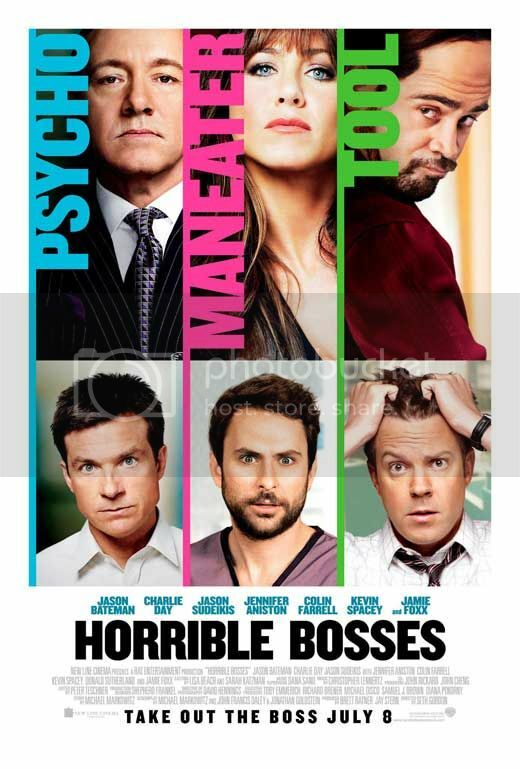 The film stars Jennifer Aniston, Kevin Spacey, Colin Farrell, Jason Bateman, Charlie Day and Jason Sudeikis. The basic plot is that Bateman, Day and Sudeikis’ bosses are horrible to them and they plot to kill them. I won’t reveal any more of the plot in case people haven’t seen it and want to in the future :). I did find the film quite funny in places, my favourite character was Dale, played by Charlie Day, and he was the main reason I found the film funny. A lot of his scenes were really really funny, but apart from his scenes, there was not too much else that made me laugh. I did really like Jennifer Aniston as the sexual harassing boss because its such a different character for her to play and was quite weird to see her in a role like that, but good nonetheless. I did kind of want a bit more from the film in terms of laughs, I had expected it to be a bit more laugh out loud than it was. However, overall I did like the film. The characters were likeable, it was quite funny and the storyline was good. Jamie Foxx was also a good addition as a potential hit man and gave a few funny scenes. I would recommend the film because the cast was well put together, the 3 main characters are the most unlikely people to ever want to commit murder which added to the comedy of it all because they were so slapdash and silly about it.